Love the hotel. wifi all day. It was my birthday and they surprised me with a cake and a bottle of champagne. Clean/AC. Staff very friendly. Only negative- coffee at breakfast sucked. Had to go to the coffee shop. 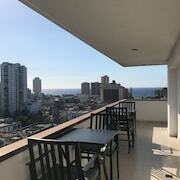 We just loved staying at Casavana, every single member of the staff did their best, the hotel is extremely clean, is great to have free breakfast, and you will want to go back! 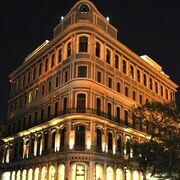 Located in Old Havana, this luxury hotel is within a 15-minute walk of Paseo de Marti and Plaza Vieja. Malecon is 0.9 mi (1.4 km) away. 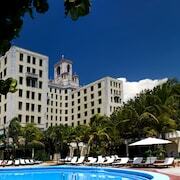 Located in El Vedado, this hotel is within a 10-minute walk of Coppelia Havana and Malecon. 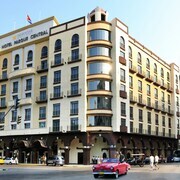 Plaza Vieja is 2.5 mi (4.1 km) away. Well hello there, proud cheapskates. 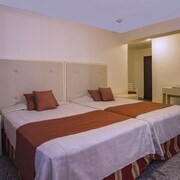 We know you're eager to squeeze the most out of your Havana getaway for the least amount of coin. But first, let's brush up on this unique destination! Havana is located approximately 19 miles away from Jaruco and 20 miles from Santa Cruz del Norte. It is an area of Cuba that around 2,200,000 people live in. No matter the type, museums are fantastic places to find out about a destination's unique history and culture. And what's best, the Casa Natal de Jose Marti, the Museo Nacional de los Comites de Defensa de la Revolucion, the Museo del Ferrocarril and the Real Fábrica de Tabacos Partagás don't cost to get in! 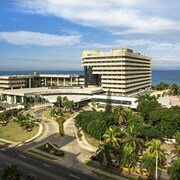 The Centro de Arte Contemporneo Wifredo Lam, the Galería de Arte Amelia Peláez, the Edificio Bacardí and the La Casona Centro de Arte are all close at hand and renowned for organizing free cultural and arts events. Peruse the schedules to find out if anything takes your fancy. Visit the Jose Marti Memorial, Palacio del Segundo Cabo, El Capitolio and Colon Cemetery and partake in a lesson in history without having to spend on entry fees. These intriguing sites provide insights into the region's unique culture. At CheapTickets, you won't need to stress out about hunting down the best deals. 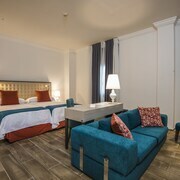 We've got it all covered for you, and we haven't compromised on quality for hotels, flights and outstanding experiences. Combine your travel and hotel bookings to save up to $481. With 500 partner airlines and more than 500,000 worldwide properties, you can be certain that we're searching for the best deals on the market. 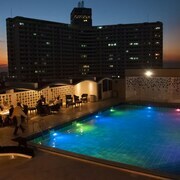 Your inner cheapskate can book without a worry with the CheapTickets Price Guarantee. Here's how it works — if within 48 hours you've come across your package deal at a cheaper rate, we'll meet it and repay you the difference. Why? Because we're wild for cheap! Book a flight, earn some CheapCash and use it on your next qualifying CheapTickets hotel reservation. Our rewards program is that simple. So, what are you waiting around for? You're so close to reaping the rewards. You'll save on all eligible bookings, not to mention penny-pinching bonus offers and perks that are sure to have you smiling ear to ear. Simply sign up for free or log in, join CheapCash and you're good to go! So, cheapster — you don't like catching public transportation, but you've still got to have a low-priced way of getting around in Havana, right? Why not see all the sights from the convenience of a rental car? It's tons more fun than being on a crowded train or bus, and you'll get to have control of the tunes! If you want to pick up a car after touching down at Jose Marti International Airport, you'll need to look elsewhere. There aren't any rental companies close by.